I am a little behind in teaching this year, so my students are just finishing up their first round of free choice essays. This means they can pick any topic/type of essay they want. My only parameters are that it has to be prose and at least a page double-spaced (normal font, margins, etc.). The way my students view this assignment is split pretty much into two. One group is paralyzed by it. They will ask me over and over, “What should I do?” “What should I write about?” and they do not like it when I tell them I want them to choose. I do give them a huge list of ideas. I have a binder and an online folder of assignment ideas. But even that list is too many choices. Have you heard that story about the boy whose kindergarten teacher told him exactly what color to color everything, and then later when he was given freedom he just continued to use those same colors? Some of my students remind me of this. They are so used to being told exactly what to write and exactly how that they just cannot function with the freedom. It may seem harsh, but I force them to work through it and I will not give them suggestions on how to start other that the assignment sheets I mentioned above and maybe a few very general ideas I toss out. Once they’ve started and have their own idea, I give them suggestions on how to move forward/improve. But, it’s important to me that they are able to start with a blank page and create a piece of writing. Then there’s my other group of students, who are overjoyed with this assignment. They simply cannot wait to get started. Some will ask a few (more like several) times, “I can write about anything I want?” or “I can write about ___?” Once they start writing, they don’t stop. They will write pages and pages. I think twelve pages is the most this time around, which is an awful lot of writing for a 6th or 7th grader. Here’s the amazing thing. When we are writing structured essays, or at least essays in which I definite the type and/or topic, I do recognize a handful of gifted writers. However, when given free choice, the quantity of great writing increases exponentially. 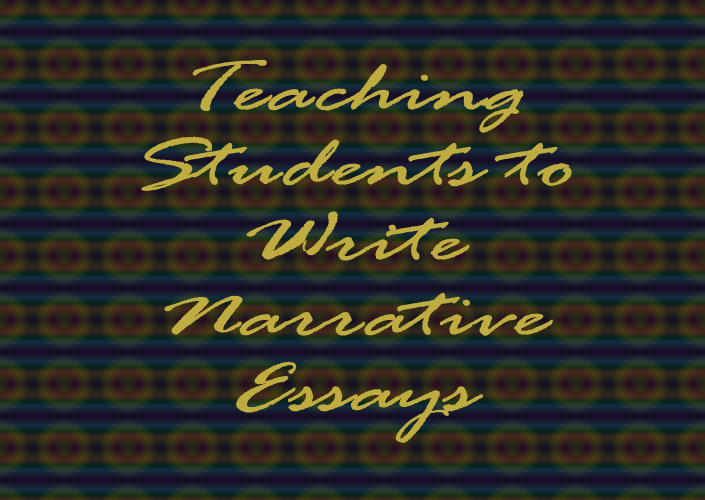 Students who have struggled to revise essays over and over and over in the past can whip out an amazing story on the first try when given free rein. I realize it’s important to be able to write to a prompt. That is the reality of most classes in school, college entrance essays, job applications, etc. However, free writing is important too. The confidence alone is worth it. They are so excited about these stories. Not one student was excited about the argumentative essay they wrote before this one. They are proud of these stories that are pages long and actually interesting to read. And of course, they are increasing their writing skill in the same way that reading books on any topic increases your reading skill. Yes, you need to be able to read and understand books that you are forced to read, but the true love of reading comes in selecting books you WANT to read. Writing is the same–free choice writing is where the love and magic happens. It builds skills that carry over into all types of writing. I’m not sure what the point of this post is. I guess I just wanted to share the joy so many of my little 6th and 7th graders felt in this assignment. And for those who were paralyzed at the beginning? Well, most of them did pretty well in the end, once they got started. It does make me think about school in general. We learn so much more when we are learning about/doing things we have control over. It’s really too bad the structure of school doesn’t allow for more independent learning. That’s where the magic happens. What was the last piece of writing you wrote that you were excited about? For me, it’s been a very long time. I actually can’t remember…I know I write often on my blog, but I don’t consider that “real writing”…more just journaling. I’ve written a few sample essays for students over the years that were fun, but nothing stellar that I feel like bragging about. Maybe I should work on a free choice essay of my own! One of the hardest things for my students to do is to write their narratives vividly enough for their readers to visualize the story. I like to use picture books for this, mostly because picture books are fun, but also because picture books are really quick, easy, high-interest examples. 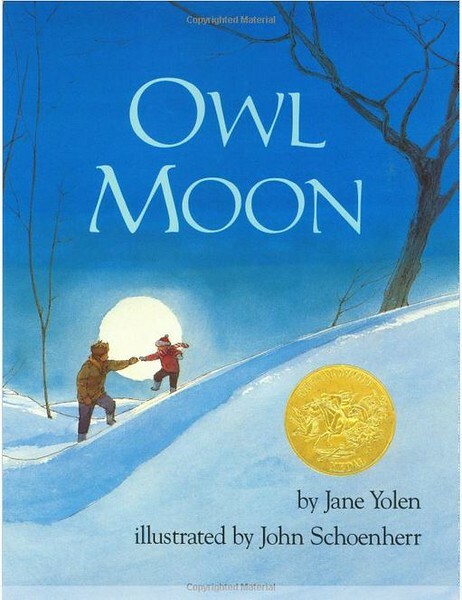 We start off by reading Owl Moon. This year, I uploaded the book to our shared Google Drive folder so they could all look at the story on their Chromebooks as I read. This way, they could actually read the words, which they cannot do if we sit “kindergarten style” on the floor while I read. Here is the full book online if you aren’t familiar with it: Owl Moon (That is retyped in a different font, which I think takes away some of the “feel” of the story, but it’s all I could find online. For my students, I scanned in the actual book). I start off by summarizing the book in one sentence: a girl and her dad walk through the woods looking for owls. Then, I explain that the writer has allowed the reader to visualize the scene and feel as if they were there through the use of “showing” sentences. I read it through once, because stopping on every page to discuss takes away from the story. Then, we go back through, page by page, and discuss which strategies the writer used to “show” the reader what it felt like to be there. 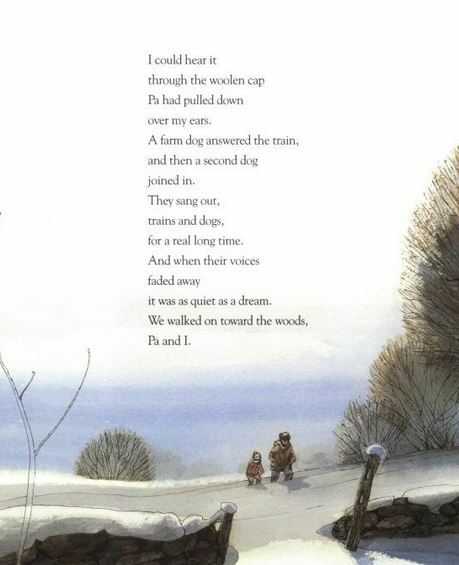 It’s such a simple story, made magical through the use of language. This is obviously a completely different type of writing. 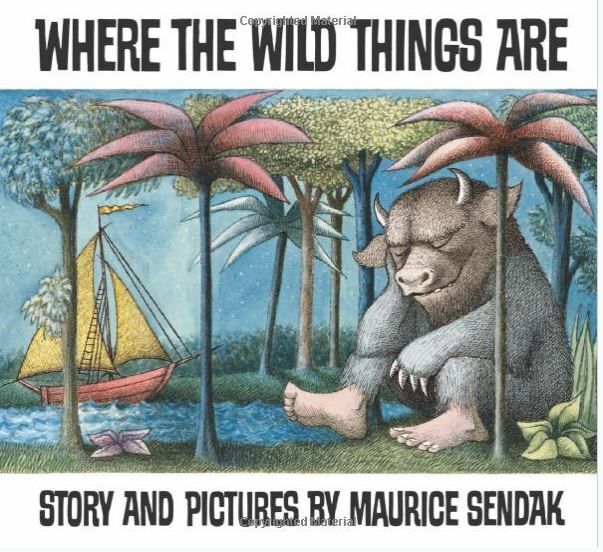 Where the Wild Things Are is mostly composed of “telling” types of sentences. 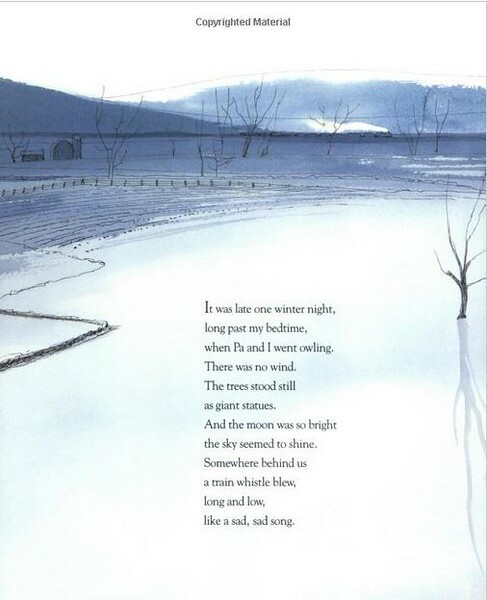 We have a discussion about why the author chose “telling” sentences (written for a younger audience, more left to the imagination, more of the story told through illustrations, etc.). After reading the story and discussing it, I put the students into groups and give them each a photocopy of a different page. Their task is to add “showing” sentences to the page. I encourage them to add emotions, feelings, facial expressions, a description of movements, and a description of the scene in general–things that help the reader picture the scene (without the illustrations) and imagine what it was like for Max to be there. I challenge them to be creative and to use the writing strategies and figurative language we’ve been studying all year. They might get a page with text, like this one, in which this could describe what Max and the monsters are doing, what Max is feeling, how the monsters react, etc. Or, they might get a “wild rumpus” page. Who doesn’t like a little wild rumpus? They do the same thing on these pages–describe the scene, tell how Max is feeling and what he is thinking, and tell what the monsters are doing. When everyone is finished, they line up in order, and we re-read the story with their additions. It’s a fun activity! Picture books are great fun–we never really outgrow them! Have you ever thought about writing “showing” sentences instead of “telling” sentences? What is your favorite picture book? When my sixth graders write their first narrative, I have them start by writing five sentences about an important time in their life. This is after we do a “choosing a topic of the right amount of specificity” activity that I need to share later. Why only five sentences? Because I want the playing field to be level. EVERYONE can write five sentences. No one feels behind. I write one, too. Here’s 5-line “essay” I wrote for one of my classes this year (remember I think it’s very important to be a transparent writer). One time I baked a loaf of bread in the evening and left it on the counter to cool when I went to bed. The next morning, a whole bunch of the bread was chewed off the sides. I knew the cat did it! I was so mad at the cat. 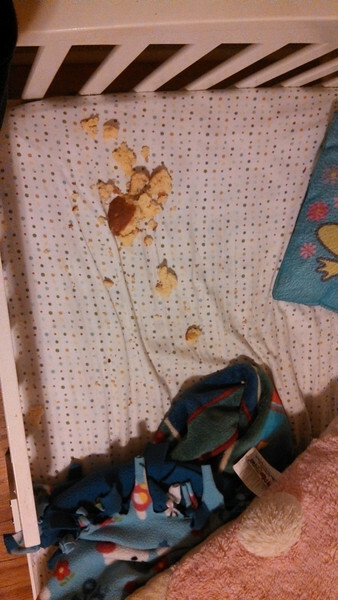 The next night when I put my daughter to bed, I found a whole bunch of bread crumbs and pieces under her pillow. (I purposely started with “one time” because oooooh does that beginning my my skin crawl. Almost as much as “This essay is about…”). Then, we walk around and read each other’s essays (mine too). As we walk around, we ask the writer questions by typing them right on the screen. There are a lot of ground rules, like only one person per computer, absolutely no talking, ONLY question-asking and no general comments (this prevents things like “good job!” and “funny story!” or even “this stinks!”). I model this before we start. As they question, I circulate too and make sure I hit the essays without many questions (I can quickly type 3-4 and the students have no idea who typed them or that I added more than one question). Last spring I baked a loaf of bread and left it on the counter to cool when I went to bed. The next morning, a whole bunch of the bread was chewed off the sides. There were crumbs all over the countertop. 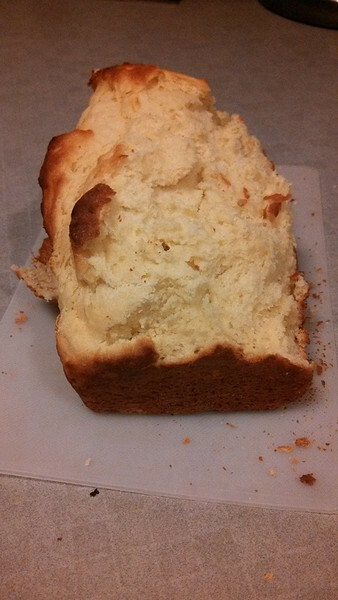 The entire loaf was practically ruined since there was a row of little chunks missing all around the top. I knew the cat, Charlotte, did it! Who else could it have been? The dog is in a crate overnight, and we have no other animals but the cat. Cats are perfectly capable of jumping on countertops. Even though our cat has never done that in the past, she was the only possible culprit. “That stupid cat!” I said to myself, “I don’t even like cats!” I even took a picture of the bread and posted it on Facebook to show all of my friends how bad my cat had been. I couldn’t wait to get home from school to check the sympathetic comments from my friends. Then, I put the cat outside. I wasn’t sure how else to punish her. You can’t exactly spank a cat without them returning your wrath. The next night when I put my three-year-old daughter Campbell to bed, I found a whole bunch of bread crumbs and pieces under her pillow. The next day, we finish up version two. As the students finish, they stand up. As soon as someone else is finished and also stands up, they read each others’ , and within a short time everyone is circulating around reading essays and typing questions on them (once again, mine too). At this point I start teaching a writing mini lesson every day. Things like using dialogue, good beginning strategies, vivid description, adding character traits, adding reactions, etc. After the mini lesson, they revisit their essay and try to add the skill we just learned about. When they are ready, they stand up, and start circulating. Not everyone ends up circulating every day, which is okay. Some are more comfortable with it than others. A week or two in, I share with them my third version, which is closer to completion. I point out the techniques I’ve used that we’ve learned about. I explain that my essay is about 95% true but that I’ve embellished details to make it more interesting and filled in things I can’t exactly remember (like exact dialogue). It’s getting to long to block quote here, but you can see all four versions here: essay progression “Framed”. When I finish my final version, I read it to them. Other days, I’ll read them the final versions from my other classes. This year, I also wrote about the time Lori and I saw the “cougar” eyes and about skiing with Evan and Lori . They enjoy listening to personal stories of mine. I’m not a fantastic narrative writer, but I think I can write well enough to explain it to a sixth grader. 🙂 I keep all of my stories in a folder where they can read them. Once they have their final versions finished, they start sharing them with me, writer’s workshop style. This continues several times until they are ready for grading. After we have written personal narratives (the easiest type), we are ready to work on other narrative tasks like writing an ending, retelling a historical account or scientific process, and so on.